This is a full-size single urn and is designed to hold the cremains of a person having a total body weight of up to 200 pounds prior to cremation. 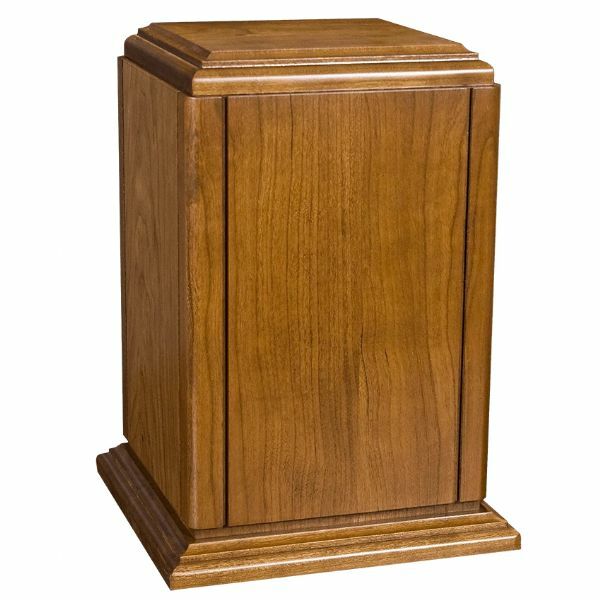 The Sherwood I hardwood cremation urn is crafted with cherry wood and features accent groves. Hardwood cremation urns exude a sense of warmth and majesty. They are constructed by master woodworkers and because wood is a relatively difficult material to work with, some wooden cremation urns are crafted, finished, or polished by hand. Because many hardwood urns are painstakingly crafted down to the last intricate detail, we recommend that they be kept at home. However, both simple and ornate hardwood urns can be entombed in a cemetery columbarium niche, or buried in an earth grave. Please note some cemetery regulations may require that this wooden urn be placed inside of an urn vault prior to earth burial.